Even though curry has its origins in India it has now entered the world of culinary delights enjoyed by food enthusiasts from the all over the world. 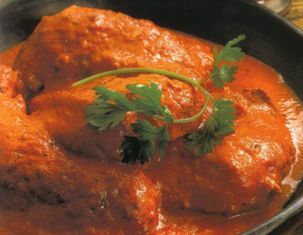 An essential part of the English dining experience; the British have conjured their own version of the curry inspired by popular north Indian curries. The myriad of flavors, the wonderful texture and the heady aromas of the spices all blend perfectly to create a one of a kind gastronomical experience. Quite simply most people find the curry absolutely irresistible. But more often than not most people are intimidated at the prospect of cooking a curry meal. Because they think it would simply be too complicated but curries range from ones that only need a few minutes of cooking to ones that can take up a whole day. Also the popular misconception that you absolutely need the ever popular curry powder to make a simply curry can be cast aside. For basic curry all you will need are a few fresh ingredients and about half an hour of your time. Start with 2 tablespoon fresh, chopped cilantro/coriander (Optional). Use a blender to make a ginger garlic paste. You can also grate them finely. Set aside this mixture. Before using the cardamom, cinnamon and cloves you will need to dry roast them at medium heat. You can use a pan or wok for this, the roasting will bring out the fragrance. Keep cooking till you can smell the aroma, but make sure that you don’t burn them. Next heat the oil and fry the cumin seeds till they sputter and add onions and green chili to it. Fry this mixture till the onions are a slightly brown. Now you can add the ginger and garlic paste and fry for another 8 to 10 minutes at low or medium heat. Add tomatoes to this mixture and cook well till the tomatoes blend in. Now you can add the masalas to this mixture and cook for another 5 minutes. You want a slightly thick sauce so keep cooking till you achieve the desired consistency. Once the curry is ready simply add the potato chunks and cook till tender. Serve the curry hot over a bed of boiled rice.